15L 290mm Square Flower Bucket Pot. 15L 290mm Square Flower Bucket. Flower Buckets are pots with no holes. Square buckets fit neatly tog..
15L 300mm Flower Bucket Pot. 15L 300mm Flower Bucket. Flower Buckets are pots with no holes. In hydro applications we usually dri.. Various pot saucers are available. The type we usually stock for hydroponic use is extra deep. Pleas..
28L 410mm Flower Bucket Pot. 28L 410mm Flower Bucket. Flower Buckets are pots with no holes. In hydro applications we usually dri..
52L 500mm Flower Bucket Pot. 52L 500mm Flower Bucket. Flower Buckets are pots with no holes. 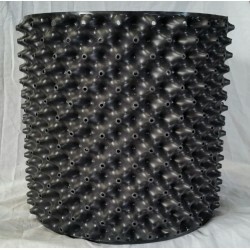 In hydro applications we usually dri..
5L 200mm Flower Pot with holes. 5L 200mm Flower pot. Flower pot with holes. In hydro applications we usually drill our own holes to ..
95L 580mm Advanced planter tub. 95L Advanced planter tub. Some people just like a big pot. Who are we to argue! Advance planter tubs.. Allows roots reaching towards the container wall to find the air holes immediately. Root binding vir..
10L 250mm Flower Bucket. Flower Buckets are pots with no holes. In hydro applications we usually dri..